This week has been notable for the cold weather. We have had clear, sunny skies and a temperature that reached highs in the low single digits. The overnight low on Saturday morning was -18 degrees. Add a breeze and the windchill made it not at all enticing to leave my house. I did get out to exercise most days and my brother and I went out for lunch on Friday. Otherwise, I've been playing computer games and working away at my stack of review books. Twilight's Dawn by Anne Bishop (Mine) - Four novellas set in the Black Jewels universe that brought the series up-to-date and filled in details about some events from other books. My review will be posted on March 3. The Blood Spell by C. J. Redwine (Feb. 12) - This riff on the Cinderella story featured a nice romance, action, adventure, and a really creepy villain. My review will be posted on Feb. 5. Past Due for Murder by Victoria Gilbert (Feb. 12) - third cozy mystery in the Blue Ridge Library series. My review will be posted on Feb. 6. Nightchaser by Amanda Bouchet (Mine) - Okay space opera. My review will be posted on Feb. 7. Crown of Feathers by Nicki Pau Preto - I didn't finish this one. I read 180 pages of 498 over the course of a couple of days but decided not to finish it when I realized that nothing happened that advanced the plot in those pages. It followed three different characters and, so far, just introduced them, provided a little information about their pasts, and talked about their current situations. Fans of middle grade fantasy with more patience than I have will possibly enjoy this one. However, Amazon Vine had the book and two reviewers so far agree with my assessment giving the book 2 stars. 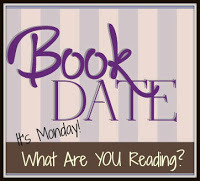 Say You're Sorry by Karen Rose (Feb. 12) is another book that I've been reading for a couple of days. It has 624 pages which I didn't know until I went to update by progress on Goodreads since I am reading this review copy on my Kindle. It is a romantic suspense thriller which begins a series. These are the next ones on my calendar. Nicely done! I enjoyed Blood Spell myself! I still need to read Nightchaser plus the remaining books in Amanda's first series! Lol! Crown of Feathers was one I received by surprise from the publisher yet the story description never really grabbed at me. It sounds like I made a good call in not starting it. Sad that you had to DNF it, but it happens. Brrrr on the cold, and I think it is cold here with a -8. STAY WARM! I didn't go to exercise this morning either. ENJOY your books - I like the cozies. I didn't have Crown of Feathers on my list, but I'll trust you and just not bother. The Blood Spell looks so good! I will have to check that series out! It is has been super cold and snowy here too! Saturday was just snowy, so it was nice to get the boy out in it, but the past two days we have been tucked up inside getting all hygge and looking at the moon. Have a great week! Brrrr. Stay warm. Say You're Sorry looks good but 600+ pages? Wow. I'll be watching for your review, I hope you are enjoying it. Have a great week and happy reading. It's way too cold for my liking. We are in the single digits here with the "feels like" number way below 0. Brrr...at least we didn't have snow. The cozies on your list look so good. I hope you enjoy your books. Have a great week! It's been cold here too- brr!! The Blood Spell certainly looks interesting! Oooh! I love the Ben Aaronovitch DC Peter Grant books on audio. I listen to them thru my library downloadable service and it's starting to look like the most recent book in the series isn't going to be available that way. I may have to break down and get it on CD or Audible. I MUST listen to it! I've been curious about Amanda Bouchet, but haven't read anything by her yet. I am finally starting Night Chaser! I like chunksters and will look into Say You're Sorry. Too bad about Crown of Feathers. The Blood Spell has a gorgeous cover and sounds like one I'd enjoy reading. Too bad Crown of Feathers was a disappointment. Thanks for visiting my reading list today! Thanks for the heads up about Crown of Feathers. I am impressed you read as much as you did before giving up. I don't usually go past 100 pages if i don't like it. I read about the cold and do wish some could be sent this way. Oh I didn't realize Cindy Anstey had a new book out! I read two of her novels and I'm adding The Hummingbird Dagger to my TBR list. You are brave to exercise outside. Chances are if I was in that cold weather I wouldn't go out! :-) Looks like another week of good reading for you. I'm looking forward to Trouble On the Books to be read next month. Long ebooks always take me by surprise! I love to read in the cold days of winter, so I would love it if I lived in your frigid climate! I wouldn't leave my home, however, so maybe that would not work so well. Have a great week with all those lovely books. The wind and cold was crazy here, too. Not as cold but way too cold for our area. lol That's impressive you got out in that to exercise!